Facebook reports earnings on Wednesday. Shares hit an all-time high of $US180.68 ahead of the report. Check out the live stock price of Facebook here. 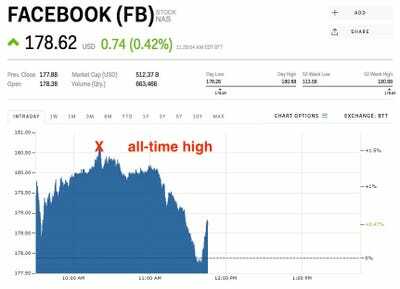 Facebook is trading at all-time highs, up 1.28% at $US180.68, ahead of the company’s earnings report on Wednesday. Wall Street is the social media giant to earn an adjusted $US1.41 per share on revenue of $US9.842 billion, according to data from Bloomberg. “Based on intra-quarter data points, channel checks, and our model sensitivity work, we view current Street September quarter estimates as reasonable, with upwards variance modestly more likely than downwards variance,” Mark Mahaney of RBC Capital Markets said in a note to clients. Mahaney says that last week’s strong results from other tech companies set Facebook up to come in ahead of expectations. Last week, Microsoft, Amazon, Alphabet and Intel all reported earnings that exceeded Wall Street’s expectations. The Nasdaq 100 had its biggest gain in two years on Friday as entire tech sector saw a boost after the earnings beats. Facebook has gained 53% this year. Read more about last week’s tech earnings reports.